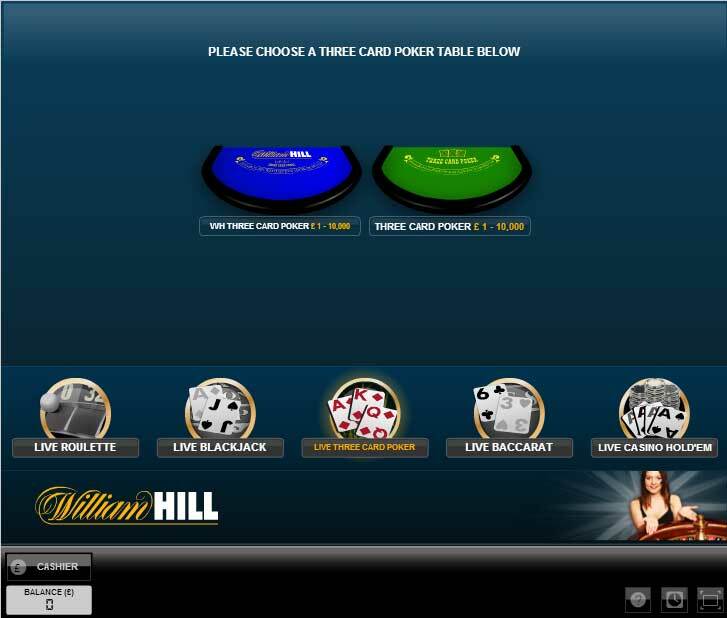 William Hill have the best of both worlds with live 3 card poker and RNG 3 card poker. With a dedicated live 3 card poker table with on table promotions and the ability to play more quickly on the RNG version they are going to be a hard act to follow. Different payout tables on both games! 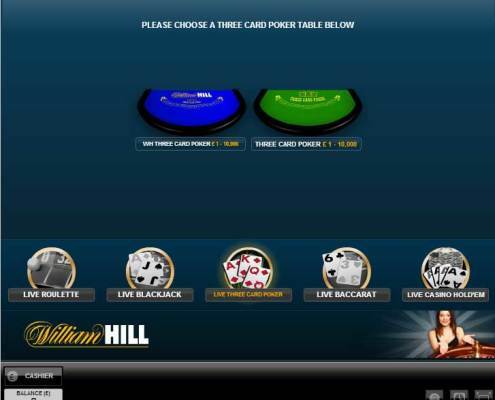 William Hill are able to offer players two different types of 3 card poker games. 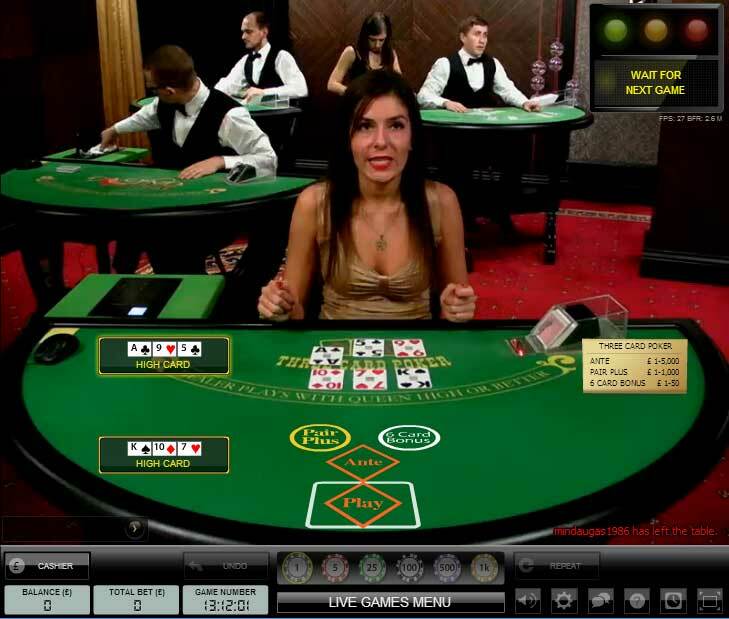 There is Live 3 Card Poker which is played against a real dealer with real cards in a live casino studio and RNG 3 Card Poker that is played against computer software. Both games came be played in your browser with no software download needed. 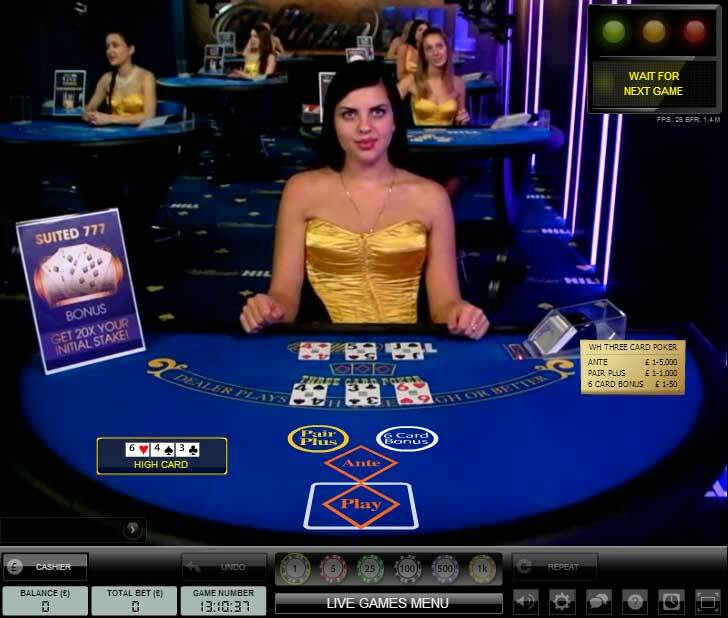 The William Hill live casino, which uses industry leading software by Evolution Gaming, is fairly unique when it comes to Live 3 Card poker. To my knowledge they are the only live casino to have two 3 card poker tables. One is a William Hill dedicated table and one is shared with other casinos using the same Evolution live casino solution. There are three main differences between the dedicated and generic tables. Firstly on the dedicated table you are playing only with William Hill customers. Secondly, on table promotions are frequently run, so you have the chance of winning extra bonuses when playing. Thirdly, the dealers and tables are fully branded in their own part of Evolution’s dealing studio. The RNG 3 Card Poker game can be found in the Vegas area of the site. Play is against computer software. The game is played in exactly the same way as the live casino game, but there some minor if not important differences. Deal time is much faster (no humans involved) and the returns on some of the bets are different between the two games. See the pay table below for a comparison. The Live 3 Card poker can be accessed from the Live Casino Lobby where you can also pick to play Live Roulette, Live Blackjack, Live Baccarat, & Live Casino Holdem. 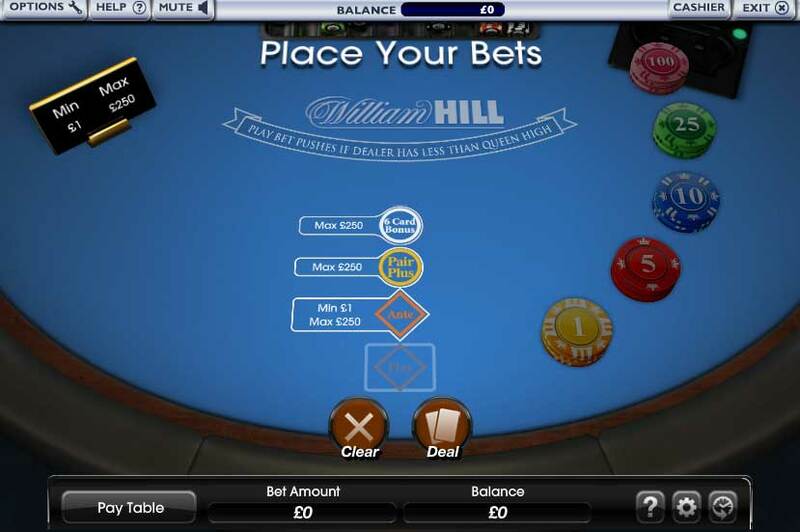 The Live 3 Card Poker has two tables, one dedicated to William Hill and one generic. If you view the images you’ll see that one is fully branded and the other is a general play table. The RNG version of 3 card poker is located on the Vegas area of the site. The table layout is similar to the live version and playing rules are the same. The only difference is one has a live dealer and the speed of play is faster on the RNG game. Note: If the dealer has less than a Queen the Play payout is deemed a push (i.e your stake is returned). Note: The payouts for Mini Royal, Straight and Flush differ between the Live and RNG games. Note: The payouts for 4 of a Kind, Full House, Flush and 3 of a Kind differ between the Live and RNG games. Customer support is available 24 x 7. They can be contacted through Email, telephone and live chat. The live chat is only available to registered players so if you have any questions you’ll have to register first. I generally only use live chat or email when contacting support and that is so I have a record of any conversations. It’s just something I’ve always done and is especially useful to have a record of bonus details as sometimes they are quite complicated to understand at first glance. Do watch out though when you’re put through to an agent that they can answer questions on Casino. I’ve got a couple of Sportsbook agents who couldn’t answer my questions so I wasted time being transferred from one to another. Other than that I’ve only got good things to say about the support I’ve received. Thankfully I’ve not needed it that often. As you’d expect from a giant like William Hill they have the ability to take a range of deposit and Withdrawal methods. If you’re based in the UK and using debit cards withdrawals are normally processed the same day. Depending on your country you can find the following Deposit and Withdrawl methods in use at William Hill – Abaqoos, BankLink, Boleto Bancario, Cheque, Click2Pay, Clickandbuy, Credit Card, Delta, Direct Bank Transfer, ecard, EPS, Euteller, eWire, Fundsend, GiroPay, iDEAL, Instadebit, Instant Bank, LineaAbierta, Maestro, MasterCard, MisterCash, Moneta.ru, Moneybookers, Multibanco, Neosurf, Neteller, Nordea, PayPal, Paysafecard, Poli, Skrill, Sofortuberweisung, Speedcard, Switch, Teleingreso, Ukash, UsemyFunds, Visa Credit, Visa Electron, Web Money, William Hill CashDirect and Wire Transfer. There are no bonuses for live 3 card poker players. Play 3 Card Poker against live dealers or the computer at the William Hill Casino. Personally I prefer the live casino game as it’s played at the pace I like (not too fast! ).